The day is warm and skies are partly clear with occasional grey clouds drifting away slowly in the skies of the Garden City of Bangalore. Great plans are being hatched up for the weekend by the city folks. But there's especially a lot of enthusiasm and buzz in Basavanagudi, one of the oldest areas of Bangalore. Famous for the iconic Bull Temple that's home to a monolith statue the mythical bull of Lord Shiva - Nandi, and the many legends tagged to it, Basavanagudi is the ground for the annual groundnut fair - the Kadalekai Parishe. The area has come to life and with its old-world charm, is filled with numerous colourful markets and stalls. The Kadalekai Parishe or the annual groundnut festival is held on the last Monday of the Hindu month of Kartik Masa, which is the reason why the festival dates vary each year. The festival dates for this year are 13th November - 14th November, the place, however, is getting all ready for this grand festival. The roads around the Bull Temple are already buzzing with people and wears a festive look. 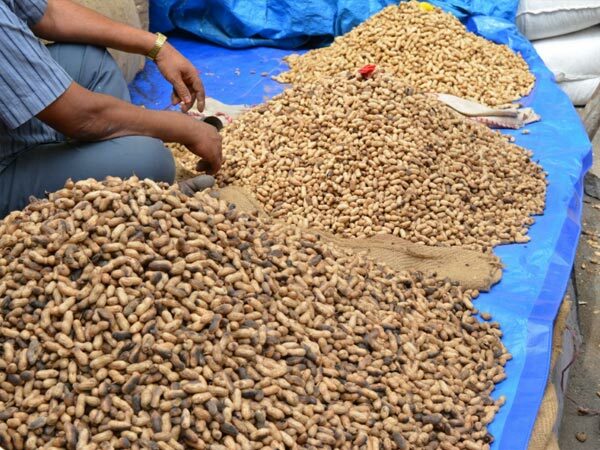 The groundnut lovers are getting all prepped up with their shopping bags as there will no dearth of choices to buy groundnuts that come in all sizes, forms, from raw to dried, semi-fried, spiced, fried, salted, boiled and roasted. Shoppers make the purchases in bulk and why not! So while the shoppers and sellers are busy at work, the city traffic police takes all the efforts to make this revered festival of Bangalore, comfortable and hassle-free for all. As the festival begins on Monday, the place will experience a huge crowd. The traffic will be, accordingly diverted with some roads blocked, so keep a tab on the traffic updates if you are headed to that way this weekend or anytime around the festival. Apart from the groundnuts, which is the highlight of this fair, visitors can also find various stalls of toys, trinkets, home decors, henna tattoos and more, set up in the vicinity. One can satiate their taste buds with the numerous food stalls selling a variety of food items. You just won't be able to keep the children away from the merry-go-rounds and the giant wheels. Every now and then you will come across a child snacking on the pink cotton candy or a seller with bubble-blower and colourful pinwheels. All in all the colours and festive mood will certainly cheer you up and stir up a lot of excitement. If you are in town or visiting Bangalore, do drop by the venue to witness this grand festival. The Bull Temple beautifully decorated and with thousands of lamps lit is a sight to behold. The Dodda Ganesh Temple near the Bull Temple looks equally beautiful with its decorations and is frequented by many visiting the Kadalekai Parishe.